In the spring of 2011 I decided to build my own multicopter. Being enthousiasted by various projects I found on the internet, I decided to build one myself. In the beginning I wasn't sure where to begin or what type of multicopter to build. So a carbon-framed tricopter attached to an HD camera seemed good to me. To be honest I think I wanted too much and didn't know exactly where to begin. So I decided to build a quadcopter (X-mode, will explain later), which is said to be easily controlled. To understand the very basics of multicopter flying, I decided to build the thing from scratch with some basic materials. On this page, I explain how I build it, where I got it and what things you should take care about. Sometimes I found it very difficult to find background information on certain subjects myself. I hope this helps you building your own quadcopter. In the build log on this website, you'll find a list of items I used to build mine. 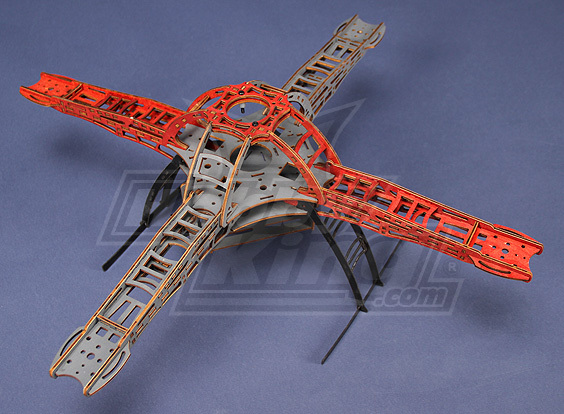 The building process of your quadcopter should be quite safe. There are just a few things you should be careful with during build and later on. First of all, the power source you're going to use. 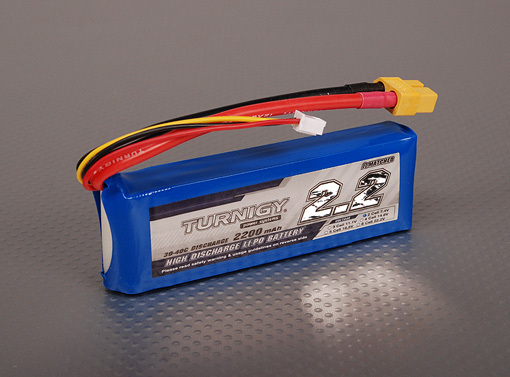 Almost every RC multicopter uses Lithium Polymer power cells as a power source. These cells can produce an enormous amount of current, needed for the brushless motors. Charging those batteries in the wrong mode or shortcircuit them, will cause exploding batteries and fire. Remember this during building and don't connect the battery unless needed. Never use propellers on your quadcopter unless needed. In most all cases, you will need them only in the final stage of construction. 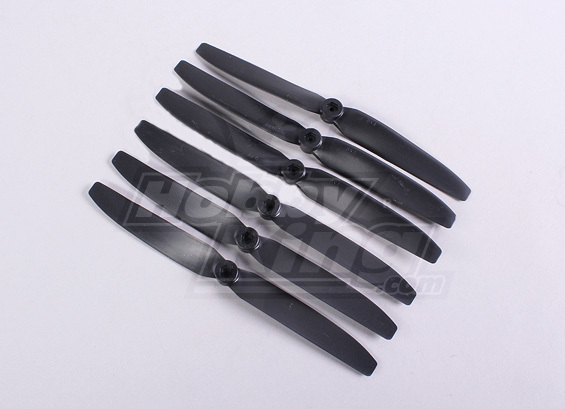 Propellers on speed are like knives and can cause serious damage to human beings and property. Always test your quadcopter on en empty field with lots of space. Keep yourself and other people at distance. Do not test it in your living room or small space, even if you get too excited! The chances of a broken quad and belongings are high. Preferably use a training frame during your first flights. This will make it less likely you'll damage the quad's propellers. The sphere in the middle is to determine the flight direction of the quad. This is the most basic and important part of the quadcopter. You can mount your brushless motors, power cells and other electronic equipement on it easily. I decided to create my own frame. If you decide to do so yourself, please keep in mind that the frame has to be firm and leveled. 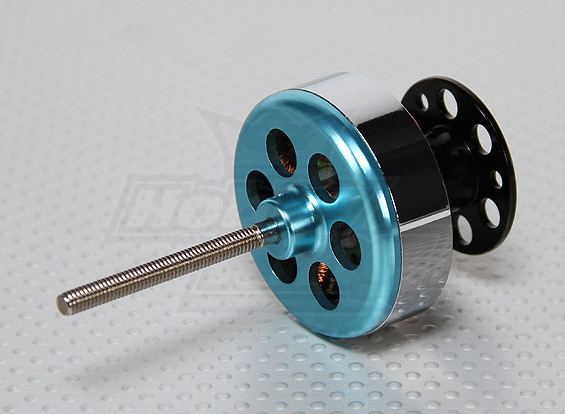 Brushless motors are commonly used in RC. A good explanation on how this works compared to brushed motors can be found on the website of howstuffworks. Brushless motors have three wires. These wires control the motor's three phases. When connecting the motor to it's ESC (Electronic Speed Controller), it doesn't actually matter how you connect the wires to let it spin. 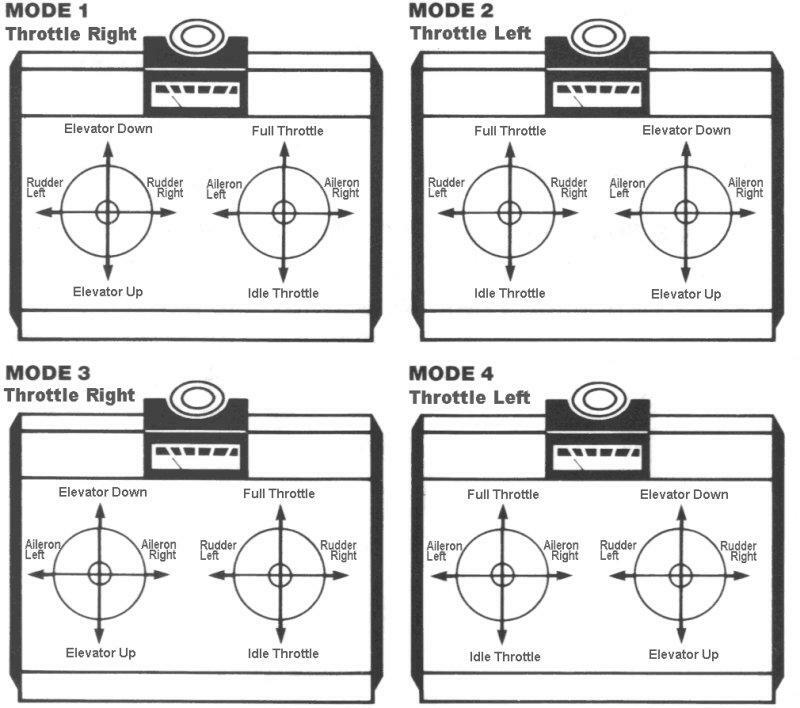 In the case of a quadcopter you want two motors spinning clockwise (CW) and two motors counter-clockwise (CCW). You just have to try which directions it turns. When it moves in the wrong direction, just switch two wires and it will turn the other way around. Lithium Polymer batteries are used for powering your multicopter. An extensive explanation about LiPo batteries can be found on this site. A LiPo calculator is included. For your multicopter to stay in the air, you'll need a equal division of CW (clowckwise) and CCW (counter-clockwise) propellers. This will ensure that your multicopter will not spin around. 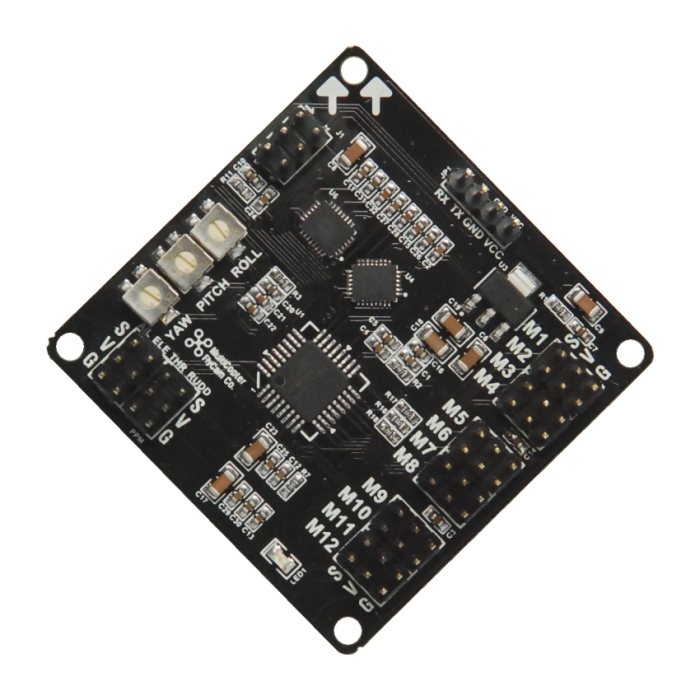 A multicopter control board is the essential part of your multicopter. It's the heart of the copter and controls the motor's independently and corrects for equal balancing. 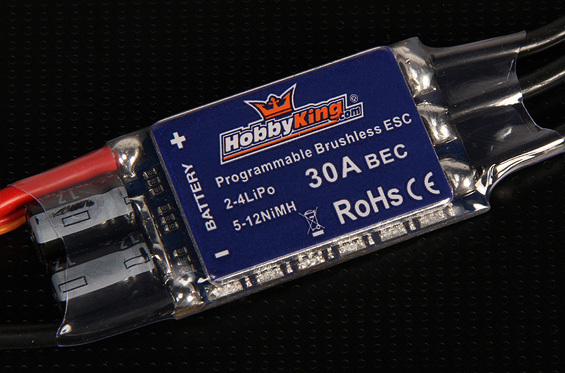 The board I used in my project is the Hobbyking Quadcopter control board V2.1. I used a blackboard v5.5 as well with the same results. Both boards are identical. Be careful where to order blackboards. There are sellers on Ebay, who are known to sell faulty not properly tested boards. Please consider official resellers on the website of the developer: http://www.kkmulticopter.com/ or order one at HobbyKing. Don't forget to order a USBASP programmer card to supply the KK board with the software configuration you need. You'll need a transmitter to control your quadcopter. I use a Spektrum Dx6i myself. This model has six channels. 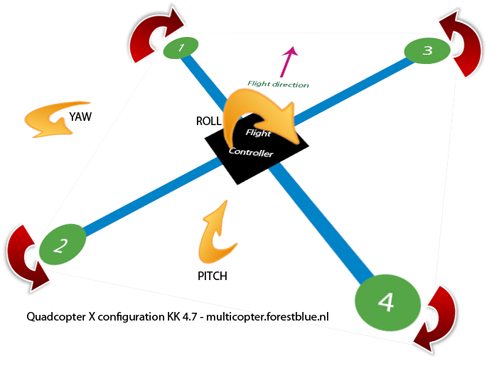 Four channels is enough for a multicopter in general. I use the fifth channel for lighting. You'll also need a receiver offcourse. The pictured receiver also uses a satellite receiver. 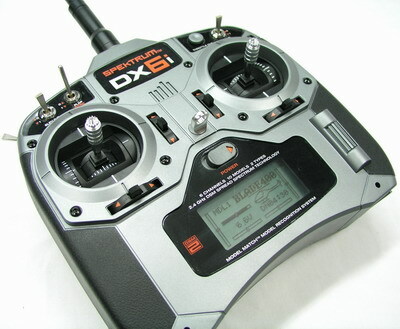 I would strongly suggest this for multicopter projects for optimal reception. The picture beneath gives a understanding of the way flight dynamics work in quadcopter flying and multicopter flying in general. There always is a flight direction, based on the mounting of your control board. This is necessary because else you won't know what will be the result of steering from your transmitter. The flight direction is often characterized by a foam ball or LED lighting, so that it can be recognized from the ground. To get yourself used to quadcopter flying, I suggest you train with PhoenixRC. 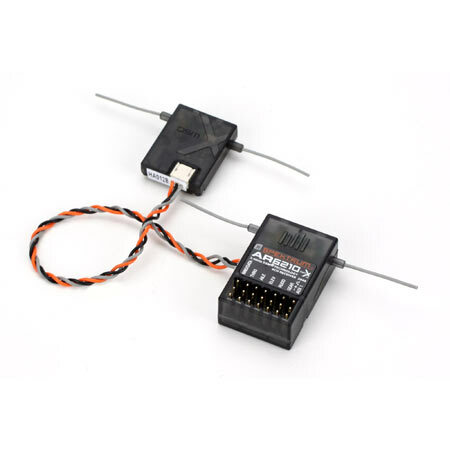 Connect your transmitter with USB to your PC and you can train with a quadcopter model included in this software package without risking real damage. Example of PhoenixRC Quadcopter flying.